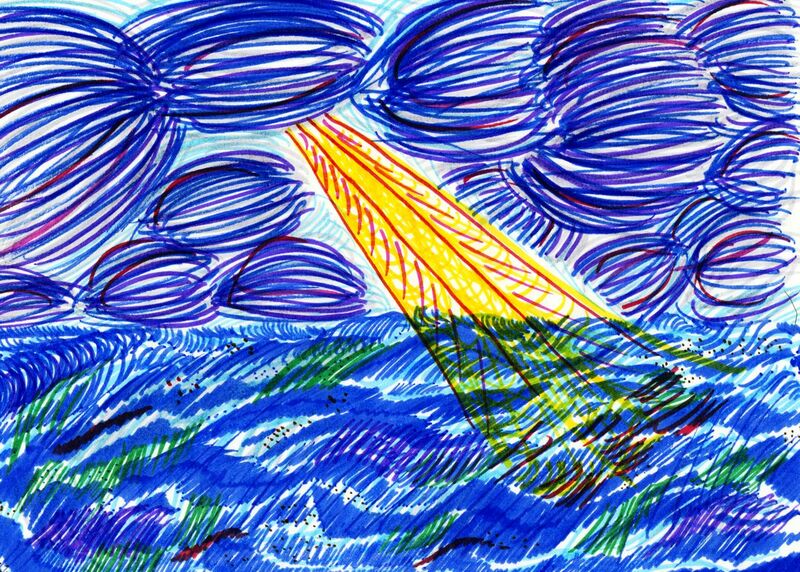 Felt tip marker on paper, October 2009. I get a lot of enjoyment out of drawing with felt tip markers. Nothing quite beats their bright colours and strength. 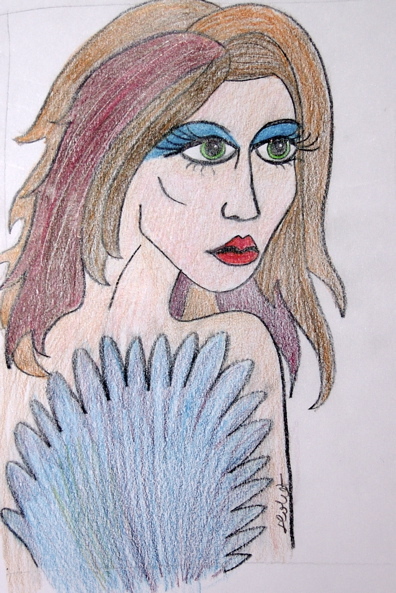 Coloured pencil on paper, October 2009. There’s a popular Australian kids’ song about a kookaburra sitting in an old gum tree. 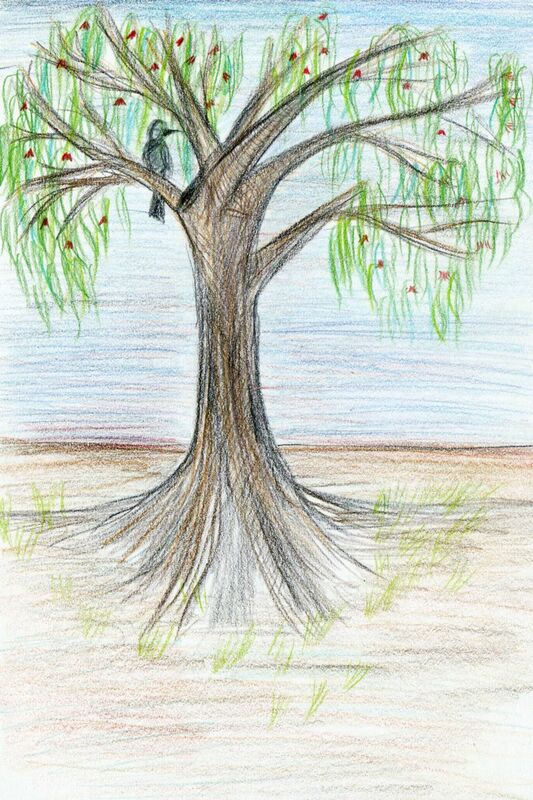 I don’t know why I thought of it, except that the tree here is gum tree-esque and there’s a bird in it. Not a kookaburra, though. I wanted to capture a sense of the Australian summer. It’s usually hot, but in recent summers it’s been awfully hot. Living in south-eastern Australia means that the weather isn’t usually too bad, but it can swing to some crazy extremes in summer (December-February) and winter (June-August). So, while we’ve had temperatures in the high 40s (degrees Celsius) in summer, we also have had temperatures as low as 2 degrees Celsius in the last week. We have a saying in Melbourne: if you don’t like the weather outside, just look out a different window. More often than not, it’s true. Grey storm clouds out the kitchen window and sunshine out the bedroom window is a common enough occurrence that I started taking that saying literally! On the topic of Melbourne, I wish I could demonstrate how it’s pronounced here. Maybe one of these days I’ll have to make a video of me talking about Aussie-isms (with my rural Victorian accent I sound more ocker than my “cultivated” husband’s city private school accent that other people mistake for being British)… and yes, I can do a fair impression of Strine. For the benefit of my multicultural friends, though, I often have to speak in the cultivated accent… though some of them find my ocker accent pretty entertaining. Ah, funny. I love being Aussie. Ink fineliner and pencil on paper, October 2009. 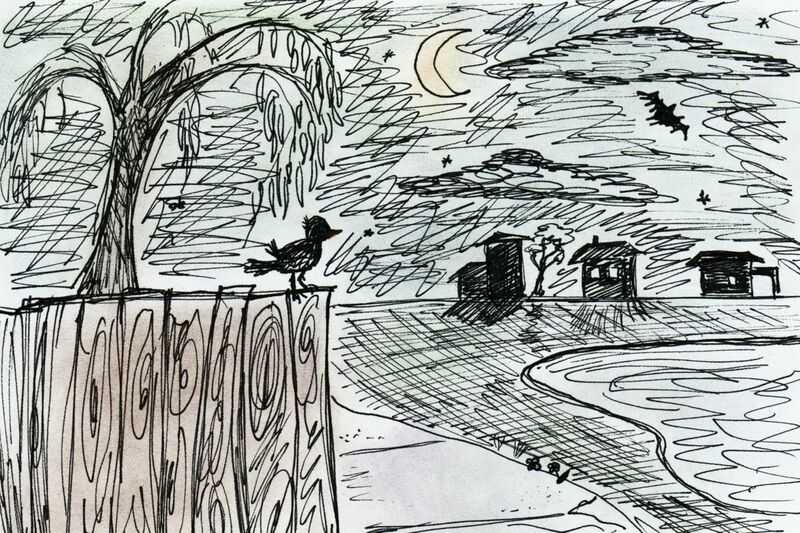 One of my favourite times of day is the evening, when the blackbirds sit on the fence outside my kitchen window and sing their last songs for the day. We get bats arround here and they look fantastic, flying their way past the Moon in black clumsy silhouettes. While I generally dislike the whole suburban living thing, there is something lovely about evenings, when the birds sing and the streetlights switch on, and I can hear people out walking their dogs and the scent of dinners wafting through the windows. It’s not all bad. This drawing is one of my many attempts to capture how I feel about this aspect of life in the suburbs. I used pencil shavings to colour the illustration. I shave bits of the coloured pencil lead and smudge them into the paper. I feel it creates a smoother textured and better blended image than if I just used the pencils the normal way. This little trick was something I learnt at school many years ago, when I was about 8 years old. I haven’t forgotten it, and enjoy using it. Last week I was helping my mother set up a new blog / website about her Lord of the Rings and Robin Hood themed art. It will be well worth adding the RSS feed to your feed reader so you can be alerted to when the blog becomes public (which is not the case as I write this). The RSS feed is feed://annepickersgillsart.wordpress.com/feed/. Her current site (as I write) is http://pic6.piczo.com/AnnesFrodoArtEtcetera/?g=1. I think her work is pretty amazing, and I’m sure you will too. She’s also been known to sell her art at http://myworld.ebay.com.au/frodosmum61/. Pencil on paper, April 2008. I think this is more of a concept piece than a finished artwork! It was just some mucking around with my pencils! This is a collage of my various horse sketches and bird sketches, all glued together! The birds are mostly inspired by southern Australian native species. The horses are mostly inspired by Arabian horses. It’s available as a card or laminated print at my Bubblesite at RedBubble.Com.